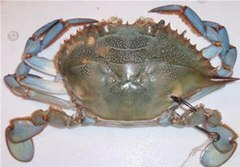 Blue crabs are the bait of choice for many Florida anglers targeting Tarpon, Black Drum and other Florida species. 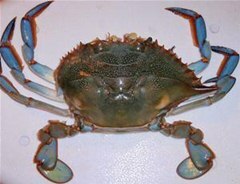 Blue crabs can be rigged cut in half or whole. Insert the hook in the light colored, almost white area just in front of the rear leg. This light colored spot is the softest, easiest place to get the hook through the hard shell. Take your time when getting the hook through the shell. Moving the hook back and forth to work the tip of the hook through is best. If the shell gets cracked it can cause the crab to fall off the hook very easily.